Hopping out of the car Hallie Smith headed into the large barn at Stonebrook Stables. After grabbing her favorite horses grooming kit she started down to his stall. "Hey Tazz," she said letting herself into his stall. Tazz was a bay thoroughbred gelding standing at 16.4 hh. "I missed you buddy." She told him as she fed him a treat. "Lets get you cleaned up." "Ready to go?" Hallie asked Tazz as she finished tightening the noseband. She led him from the barn and towards the main arena. 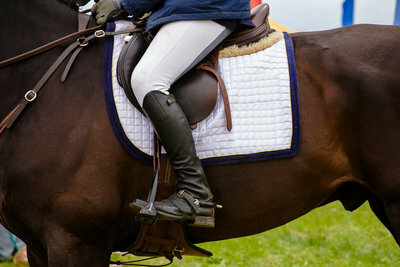 Once inside, she tightened her girth, pulled down her stirrups and mounted him. "Let's get you warmed up." She said asking him for the walk. She took him a couple laps around the arena before asking him for the trot. After balking at her a couple times, he broke into a nice, steady trot. She began rising with every other beat as she rode a twenty meter circle. "Good boy, Tazz." She told him as she rode a serpentine and trotted down the long side. After trotting a few more minutes, she asked him for the canter. He broke into the gait smoothly, his long sweeping stride covering the ground. "Nice warmup. Now, why don't you trot him over those two cross rails." Hallie's trainer, Lisa Conners called as she came into the arena. "Okay." Hallie responded as she trotted towards the small cross rails. They popped over them with ease. "Good. Now trot over them one more time then we can canter them." Lisa said. Hallie trotted over them once more then asked Tazz for the canter. She cantered him a circle to get him at a consistent pace and lined him up to the jumps. They finished the line easily. "Very good. Now canter over those again but add in those to verticals." Lisa said. Hallie grinned. Finally jumping some higher stuff. She nodded and cantered him up the line. "You did so good today!" Hallie told Tazz as she finished hosing him down. "We can go play out in the pasture for a bit." She said leading him out of the barn. Once inside the pasture, she removed his halter. "Follow me, buddy!" She called and jogged off a few feet. He immediately trotted after her with a loving nicker. "I love you." She told him as she fed him his carrot. "What would I do without you in my life?" Please check your facts next time you write as we don't want to confuse. Thanks!